This morning, a couple of my Facebook friends posted a quiz they'd taken on their walls. That's usual. As you know, dear internet savvy reader, people take stupid quizzes on FB all the time. How else are they going to know which 19th Century novel heroine they most resemble or how well they would fare in a zombie attack? Or this? This quiz was different, though. It wasn't from Facebook. 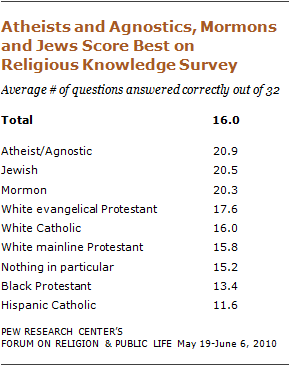 It was from the Pew Forum on Religion and Public Life. It's called the U.S. Religious Knowledge Quiz (you can take it yourself here). Its goal is simply to test basic knowledge of the world's major religions (and, apparently, Mormonism… What, Pew guys, nothing about the "Society of Friends"?). I, of course, immediately took the quiz and, not surprisingly for someone who occasionally writes a religion-themed blog, I aced it (honestly, I guessed on the last one…). Actually, I spent most of the quiz asking myself how anyone who had any religious history at all in the U.S. could get any of the questions wrong (except, as I mentioned, that last one… guess I should bone-up on my "preachers of the First Great Awakening"…). But then, nobody lately has accused Americans of being over-educated. Things became more interesting when I looked at the analysis of the results (which you can find here)(I'm using an awful lot of parentheses in this post). As it turns out, "religion bloggers" is not one of the categories of people who were rated for accuracy on the test. Atheists and agnostics, however, were. And they really knew their stuff! I suppose that one possible interpretation of these results would be that the more you know about religion, the less likely you are to want to be a part of it. While that seems likely to be the case to me, I don't think that you can come to that conclusion just from these little statistics. It's a fun thought, though. Anyhoo- just thought I'd make you aware of this. We'll bring you new developments as they come… Or whatever. << Erm… Jesus Never Hugged? I missed a question! I was very annoyed. Can’t remember what it was though. I’m pretty sure it was about Hinduism, but I took it a while back so I’m not sure. Erggg… I missed two! But no big deal, because I’m not trying to obtain nirvana and I will not be observing any sabbaths any time soon. I will be partaking of blasphemy and godless acts in the very near future, however. It doesn’t surprise me one bit to see atheists scoring highest on these sorts of tests, and it is quite interesting to see how the religionists score against each other.